Spilling into rivers in immense numbers every summer, salmon have historically been at the heart of both the ecosystems and cultures of the Pacific Coast. For the bears and people that eat them, salmon are basically an extremely efficient method of gathering food from far away (the oceans), and bringing it reliably back home, in the form of fat tasty fish. Rotting fish carcasses feed plants as well as the animals: trees grow three times faster on salmon-spawning spawning streams. Salmon made the Pacific Northwest rich. Before contact, the Alaska and British Columbia coasts supported one of the densest human populations in North America. And salmon outnumbered people by 1000 to 1. Today, one of the richest salmon producing areas in the world is in Bristol Bay, where salmon outnumber people by 10,000 to 1. There are six species of salmon on the Pacific Coast of North America - five native species, plus the Atlantic salmon (found primarily in salmon farms, and in escapees from those farms). The native species are the King/Chinook, Sockeye/Red, Silver/Coho, Pink/Humpy, and Chum/Dog You can read more about the native Pacific salmon species and the Atlantic escapees from the Alaska Department of Fish and Game. Salmon are born in a stream, spend most of their lives at sea, and return to the same stream in which they were born, with a few errant fish allowing the colonization of new streams. Each run of salmon becomes adapted to the particular conditions of its home stream. It's a great system, and has historically made the salmon a very resilient fish, since at any given time there is a huge number and diversity of different runs, able to adapt to different conditions. Salmon are no spotted owl - they can spread like weeds. But we can break all that. Spawning salmon congregate in huge masses at stream mouths, right near where people like to live. Their amazing numbers make it nearly impossible for most animals make a dent in them, but incredibly easy for technologically equiped humans to overfish. Their dependence on freshwater habitat for raising young fish makes them susceptible to all the ways we can damage that habitat. We've been decimating salmon stocks for hundreds of years - in the 1700s and 1800s in Europe, in the 1800s in eastern North America, and in the 1900s on the west coast of the continental U.S. In each place, we've managed to decimate them even faster. Commerical salmon fishing is unique among resource extraction industries. Rather than profiting from the destruction of the natural environment, salmon fishermen depend on a healthy ecosystem for their livelihood. People often consider a vegetarian diet to be the best for the environment. And there are problems with meat farming (including salmon farming). But to plant fields of corn, or soybeans, a farmer completely destroys the ecosystem that existed on those prairies before. Salmon need undammed rivers and streams, unpolluted, surrounded by healthy forests, and a healthy ocean to end up in. This makes the wild salmon fishery a natural ally of environmentalists who want to preserve not just salmon, but entire ecosystems. 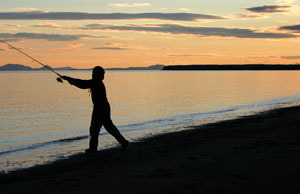 Sport fishermen are also natural allies for the preservation of salmon habitat. Trout Unlimited is a fishing-based group that does a lot for salmon and trout habitat conservation. Of course, the environmental positives of the fishing industry only works if the fishery is managed well. At least in Alaska, this is true now, but there is a rocky history of overfishing across the region. Without any fishing, an average of four to six salmon return as adults from each pair that is allowed to spawn (this also assumes the habitat is healthy). This suggests an obvious harvest level - no more than half the fish. But what seems obvious in principle hasn't always worked out so well. In pre-contact times, native groups owned particular fishing areas, which gave them a good incentive not to deplete the fish runs there. But in the mid 1800s, two things changed this equation: fishing boats and canneries. Historically, salmon were caught in the rivers, in traps or nets. Fishing from boats freed fishermen from the constraint of a particular stream's run of salmon, allowing them to catch more fish, and beat the other fishermen to them. But when all the boats are fishing in the same water, there's no incentive not to catch as many as you can - the tragedy of the commons. But even with fishing boats there were still far too many salmon for the population of the Pacific Coast to eat them all. To get truly massive harvests, you need the cannery. Canneries started up in this region in the 1860s, shipping cheap tins of salmon across the country and around the world (to places where formerly cheap Atlantic salmon were already nearly wiped out). Now salmon is expensive restaurant fare, but it started out as poor man's food. Alaska generally follows the 50% escapement rule today, which seems to be working out okay. But for most of the salmon's range, with greatly depleted stocks and damaged habitat, 50% isn't nearly enough to rebuild them. We've added a lot of things to our rivers that aren't so great for salmon (dams, sediment, and toxins), and removed a lot of things that salmon need (log jams, flood plains, gravel, and water). Renewable hydropower comes at the cost of a bunch of enormous dams, blocking formerly abundant salmon rivers like the Columbia. Obviously, dams block fish. What's less obvious is that they make the river a bad place for young fish to grow up. Even if all the fish are passed safely by the dams, via ladders or trucks, there's still no current in the river to help the young fish on their way to the sea. It takes them too long, and they become saltwater fish before they reach the salt water, leading to vastly increased mortality. A lot of what we've done to the fish is a byproduct of what we've done to the forests. Salmon carcasses fertilize the trees, but the salmon are probably even more dependent on the forests. A river flowing through a forest is a messy thing, full of log jams, rapids, pools, and constantly shifting channels. All of which gives salmon calm places to lay their eggs, and to rest on their way upstream. In logging the forests, we removed the shade that keeps the streams cool (necessary for salmon) and the logs that make the log jams. Clearcuts and logging roads send floods of eroded sediment into salmon streams, burying gravel and eggs in a flood of mud. Acid runoff and metals from mines wipe out salmon in downstream waterways. Irrigation water drawn from salmon rivers draws young fish along with it, and leaves behind trickles. Development and levees in floodplains strip most of the salmon habitat from a river. It seemed like the perfect solution to the problem of declining fish stocks: just harness the power of science to make more fish! Though the concept of a salmon hatchery was figured out in the 1730s, it was ignored for over a hundred years, until declining salmon populations were becoming a real problem. The beauty of hatcheries is that they were (and are) a politically easy solution. Fishermen don't need to catch fewer fish, dammers and developers don't need to mend their ways. Extra hatchery fish can make up the difference. The only problem is that hatcheries don't work. Not only do they fail to make up for declines in wild runs, they hasten their decline. Hatchery fish can't be separated from the wild ones at sea, so fishermen targeting hatchery fish can wipe out endangered wild stocks. The large numbers of fry dumped into streams by the hatchery are better adapted to the hatchery than they are to the real world. They crowd out the young wild salmon as fry, mate with them as adults (reducing local adaptations), and generally fail to survive in the numbers they're expected to. Fewer than 1% of hatchery smolts return as adults, and streams with hatcheries actually produce fewer total fish than streams without them. Hatcheries are an expensive mistake, costing anywhere from $10-$100 per adult fish produced. We've spent billions of dollars on them. In a 1990 analysis for Bonneville power, it was determined that only 8% of the 300 hatchery projects studied had any positive effect at all. In effect, hatcheries reverse the miracle of salmon. Wild salmon gather food from the depths of the ocean, and bring it back home, enriching the land. But hatcheries dump more total mass of young fish into the streams than ever return as adults - feeding the ocean instead of ourselves. About a third of the salmon caught in the world come from hatcheries. Modern salmon farming started in Norway in the 1960s, and exploded from there. About half of all salmon sold and consumed around the world come from farms - one million metric tons in 2000. Imagine a pen of lions on the savanna. Imagine the farmers running around like crazy, hunting wildebeest, gazelles and zebras, tossing them over the fence into the lions' voracious mouths... Imagine them slaughtering the lions for meat. Salmon are carnivores. And there's a good reason that people have historically chosen herbivores for livestock. It takes about three pounds of wild-caught fish to produce one pound of farm-raised salmon. Instead of reducing impacts on ocean stocks, salmon farming triples them, and offloads them onto different species. A salmon farm is basically a packed cage of fish, parked in a protected cove. Almost all of them circulate water to the open ocean, allowing a free mixing of sewage, diseases, antibiotics, and other appetizing things. One fish farm produces as much sewage as a ten thousand person city, and dumps it into the ocean with absolutely no treatment. The drugs and antibiotics that prop up the overcrowded fish can poison other marine life. And salmon farms cause even more problems when they coexist with wild salmon, as they do in Washington, and especially in British Columbia (there are no salmon native to Chile where many salmon are farmed). Salmon pens are often plunked right down in the middle of wild salmon migration routes, where adults come to spawn, and the young swim past on the way to the sea. The farmed salmon eat a fair number of these wild youngsters. And they infect them all with sea lice. Sea lice are mostly benign on adult salmon, but these flesh-eating parasites are devastatingly fatal to juveniles. In wild populations, this isn't a problem. Adult salmon are far to sea when the young make their migration, so they are spared from sea lice until they're big enough to handle them. But salmon pens place sea lice right in their paths. Concentrations of sea lice are 30,000 times higher around fish farms than they are in the ocean. A British Columbia study showed that when young salmon swam past the farms, sea lice killed anywhere from 9% of them (early in the season when lice numbers were low) to 95% of them (later in the season when lice numbers were higher). Even on the Pacific coast, farmed salmon are Atlantic salmon, alien invaders which can potentially breed with or crowd out the native wild fish. Sea lions are drowned in the nets while trying to eat the salmon inside. But farmed salmon are cheaper. You can get a tasteless, textureless chunk of pink flesh for half the cost of the real thing! In addition to being tasteless, that fillet has 16 times the levels of PCBs found in a wild-caught fish, and is dyed by a chemical additive to the feed, allowing the farmer to choose just what shade of pink they'd prefer (wild salmon get pink by eating krill).